ScraPerfect: How to Make a Frugal Military Scrapbook Page. Penny here today with this layout featureing my mother's first cousin Jay Jr. when he came home from the war. This was a popular pose for returning servicemen so they could show off their Honorable Discharge papers, and express their joy at returning home alive! 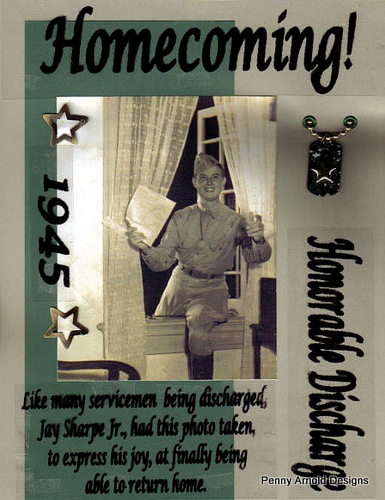 "Homecoming 1945, Honorable Discharge! Like many servicemen being discharged Jay Sharpe Jr. had this photo taken to express his joy at finally being able to return home. " You will have to excuse the blurred lettering as this was my very first attempt to print on a transparency. I promise I will get better at it, however for a first try it ain't too shabby! From what I have since read you can get a better result by adjusting your printer to a transparency setting or a low / economic ink setting which uses less ink, and therefore produces less blurring. I should have also used the Perfect Crafting Pouch from ScraPerfect. It would have worked wonders on the print quality on this layout. As explained in this Video. Oh well at least I know better for next time. Some of my frugal tips on this layout also include fake "dog tags" that I stole from my grandson's GI Joe. Shhhh.......I didn't tell him, he thinks he lost it! The stars surrounding the "1945" are really little girl's hair barrettes! They already had the look of aged brass so they fit in perfectly with this military themed layout. Dog tags, were removed from a child's doll.